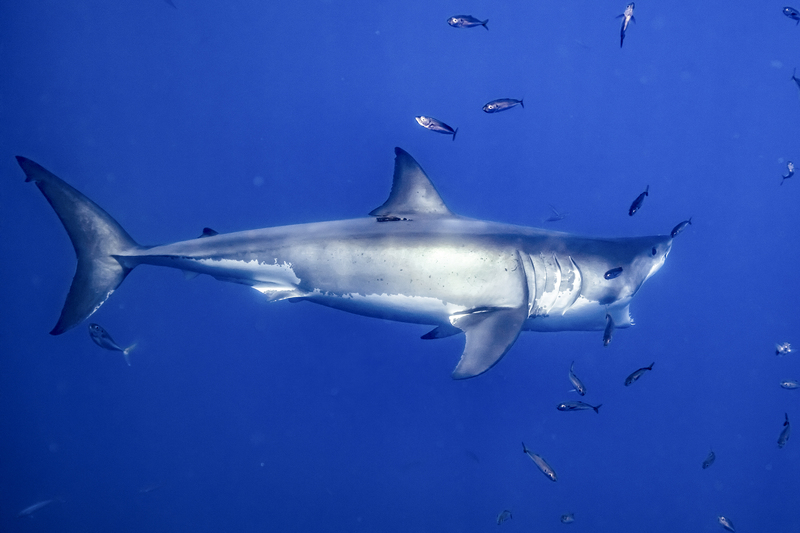 This weeks trip to Guadalupe Island was an absolute pleasure! We had a great group of guests and shared a lot of fun moments. One of them was “Frequent Flyer Mike,” thanks for joining us on a 13th trip!! We were blessed with great weather and numerous sharks. At any given time we had between 3 to 6 sharks around the boat. The surface action was very interesting on this trip as well. A few younger male sharks were breaching out of the water often, trying (and at times succeeding) to eat the bait. 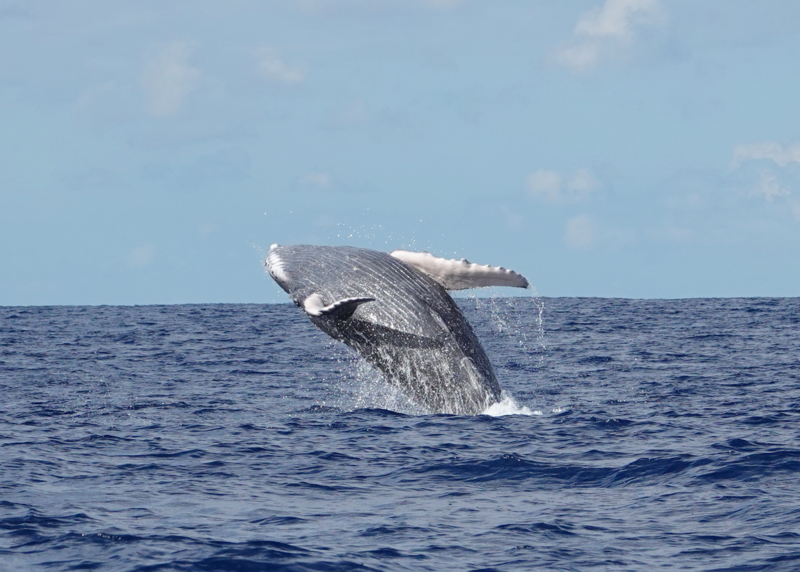 As the youngsters often swim fast and are very agile, it provides great surface action. We also saw seagulls sitting on the surface around the boat, sometimes they flew in to get a bite of the tuna bait and at other times the sharks would swim towards them and chase them away! A sea lion also swam by our cages and disappeared under the Nautilus Explorer. However the most exciting surface event was a small turtle coming up for air right next to us. The sharks showed immediate interest in it. The poor little thing kept its front flippers on top of its shell and its back flippers tightly tucked in, only paddling fast when no sharks were in its vicinity. It looked a bit like a floating coconut shell. The sharks nudged it several times. And then, out of the blue, a shark breached completely out of the water, catching the turtle between its jaws! A big shout of “WOW”s escaped everyone who was on the back deck. 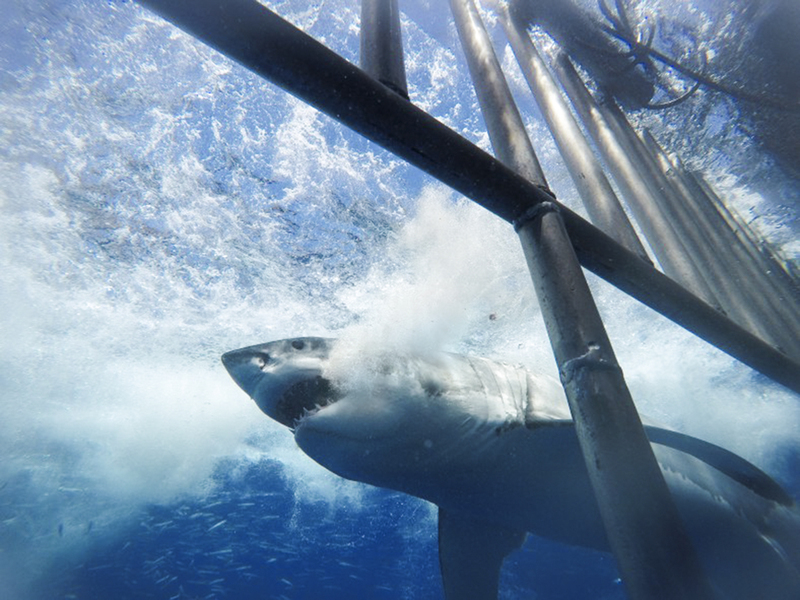 We are back again at Guadalupe Island to see the great white sharks! This time it is with a special group of fabulous shark lovers. Since the first hour on day 1, the guests have all been excited and ready to jump in the surfaces cages. After the first dive we could see the happiness on their faces and they haven’t stopped talking about how great the sharks are. 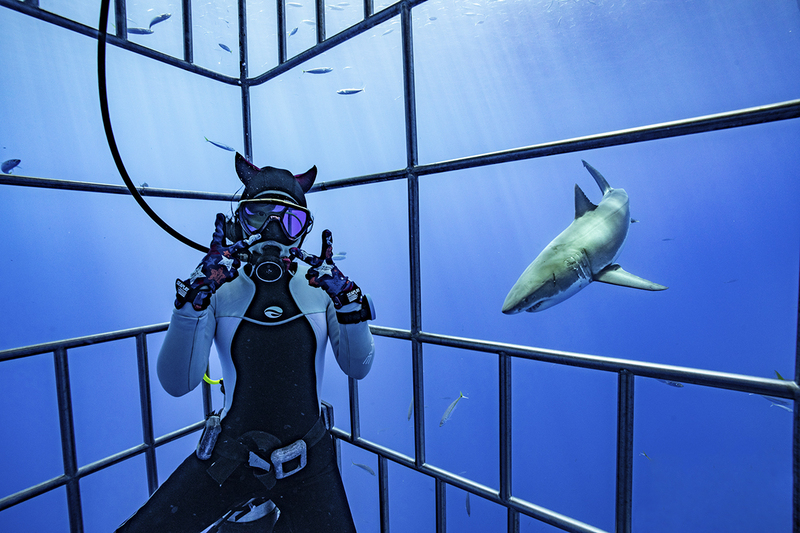 We had about 7 or 8 different sharks with us all day and the guests were all really excited, especially the youngest guest, Sam, who dove with me in the submersible cage and said he had a blast watching them. I really hope day 2 and 3 are amazing like today. The guests deserve to have all this fun with the great white sharks! It was a sunny day from start to end. The bright sunrise, casting the first lights in a particular angle, showed us some beautiful arches formed by lava tubes on the shore of Guadalupe that we don’t get to see every trip. A precious moment of the day was brought to us by “Joker,” one of the male great whites that we have had around the boat lately. 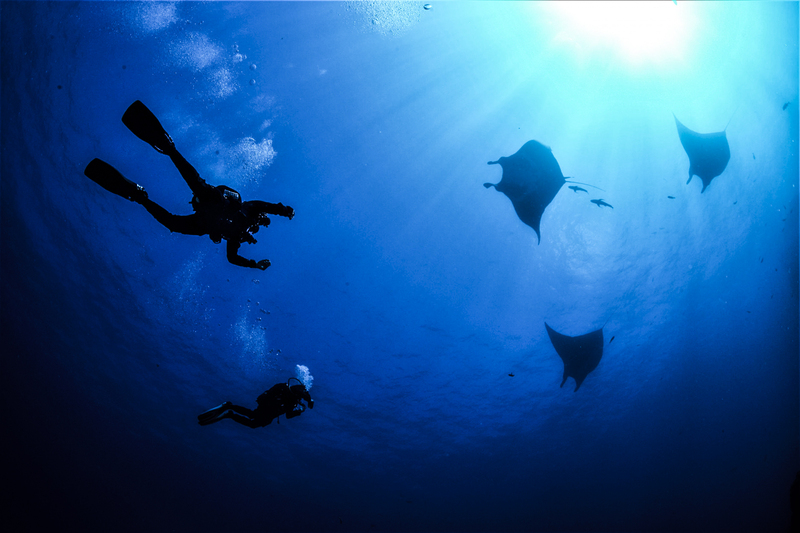 He was passing again and again around the submersible cages, closer and closer, ignoring the bait up above. Some people leave cage diving off their bucket list because the say it is not really diving, and the interaction is less natural… but really, when you dive with big sharks, more than 4 metres long, and you have them coming right at you closer and closer, looking you in the eye, the tranquility brought by those steel bars, even though the shark is very unlikely to attack you, allows you to calmly admire every detail of their body. 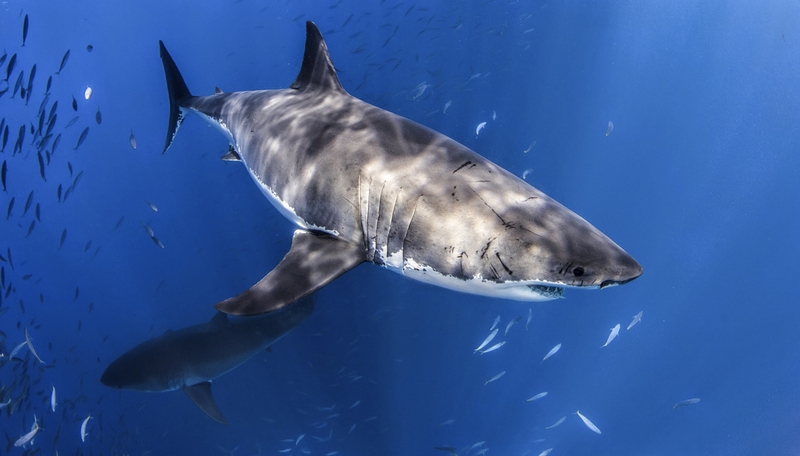 To examine every spot of grey over white along their bodies and fins (to identify them) and it is just the best way to truly admire the sight of such magnificent creature. Good night everybody.